Took some time today to advance the work on 1002’s neck. 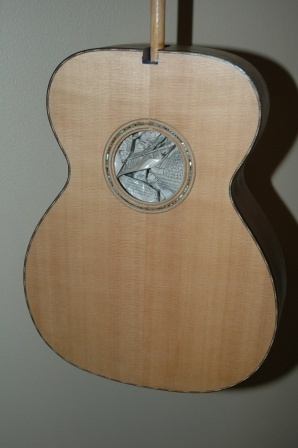 As it is a Spanish Style neck, slots need to be cut at the 14th fret for body side insertion. 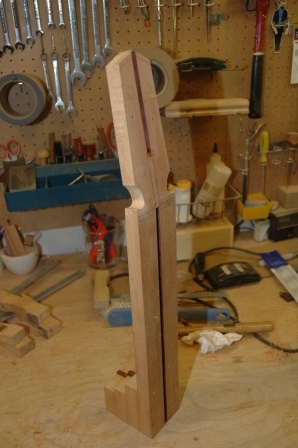 Two slots are cut (perpendicular, as there is little body arch at the neck) on either side of the neck, leaving 1″ of stock between the bottoms of the slots. 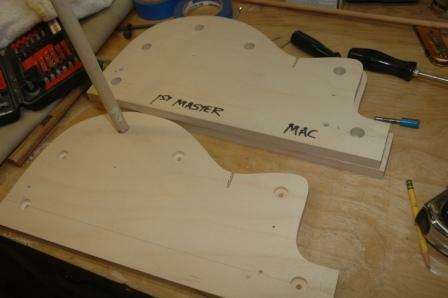 The slot on the cutaway side will have a small blank inserted to meet the cutaway side at a 90 degree angle. Thoughts of binding and purfling in this tight little area have me wondering. 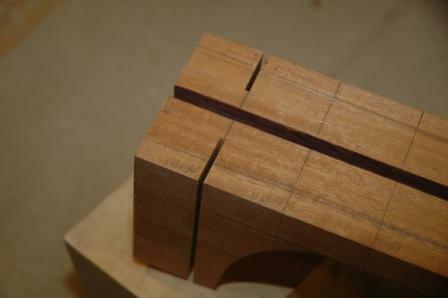 The neck profile has been marked and cut off in the bandsaw, leaving the neck at the approximate width, tapering up from the nut toward the heel. The block piece of the neck which is inside the guitar body will be trimmed down to allow the cutaway to run under the fretboard and flush. That cut will wait until the sides are bent and ready to be installed to the top and neck. 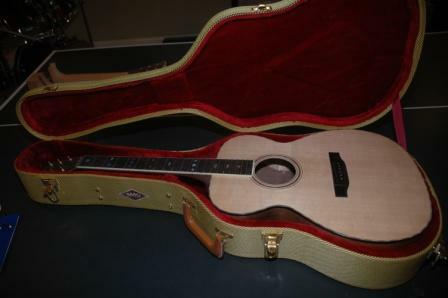 On page 8 of Allied’s weekly specials, one of my guitars, the parlor with the sinker redwood top, is featured. There’s a link there to this blog, so if you are here via the link, welcome. My blog is a blow by blow account of the building of my guitars and ukes, where I expose myself through my mishaps and victories. If you are a builder, hopefully you can learn from my mistakes and help me celebrate success. Leave comments, make suggestions, ask for advice, I always respond. I do get spam, and am quick to dismiss if you offer prescription salves over the interweb. 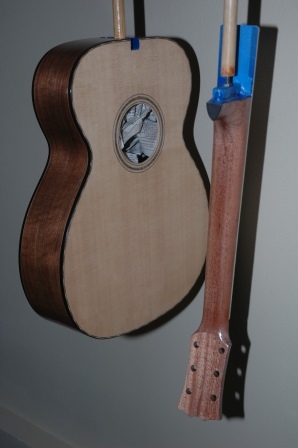 The cutaway ram has been installed on the new uke side bender, and I’m ready to test some bending. I have koa sides which I errantly tried to bend in the full sized bender, which cracked and burned and did not accept a full bend which I will run through this new bender to check. I will test some new theories, practice the steps, make amends, then check the results before bending some virgin side plates. After the initial bending, I will let cool, then reheat again, then let cool before releasing from the mold. The spray odyssey begins. One coat of sanding sealer (lacquer) before applying the pore filler. The walnut OM color and grain is jumping out even with one coat. 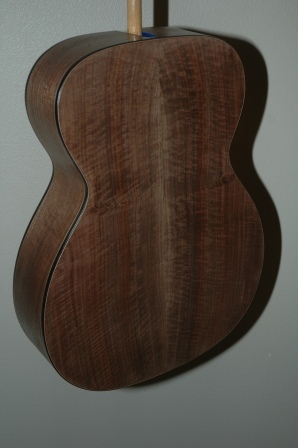 The bubinga uke got the first spray treatment. Some imperfections revealed themselves, but should be hidden once the 12th coat of lacquer gets applied. 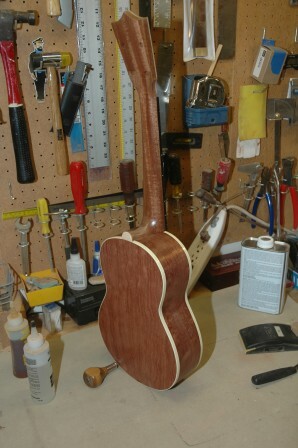 The koa dreadnought is awaiting further sanding. I am going to sand this guitar way too much vs. previous attempts to sand too little. 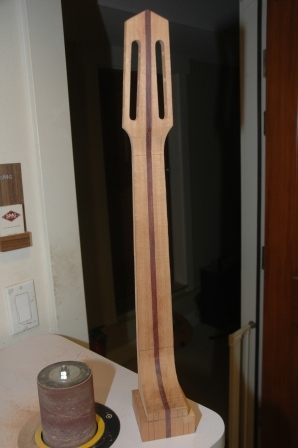 Finished the side bender for uke sides. 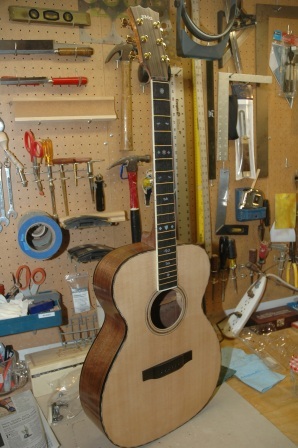 Awaiting the delivery of the cutaway ram, which will be used to clamp down the waist. The stage is set for the dreaded retreat to the spray booth. Spraying lacquer is a process which is a whole lot of setup followed by very brief spraying sessions culminating in a necessary yet dreaded cleanup. It behooves one to have several guitars ready for spraying at the same time. 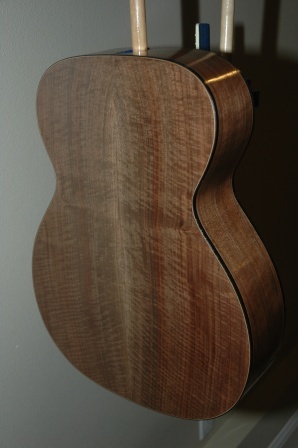 I have delayed spraying the koa dreadnought to get the walnut OM and the bubinga tenor uke ready for spraying as well. That’s three instruments staged for spraying at the same time. I have traditionally used nitrocellulose lacquer, with excellent results but questionable effect on my respiratory system. Even though I use a vented booth and a respirator mask, I have experienced deleterious effects from the nitrocellulose. This round of spraying will employ a water based lacquer, KTM-9. I have used KTM-9 in the past, and applied it with a brush, and the results were good, yet I anticipate the spray application to be excellent. I have had mixed results with the pore filling steps, and this time am committed to ensuring the pore filling will be immaculate regardless of how many applications I need to fulfill a mirror surface on the back, sides and neck. 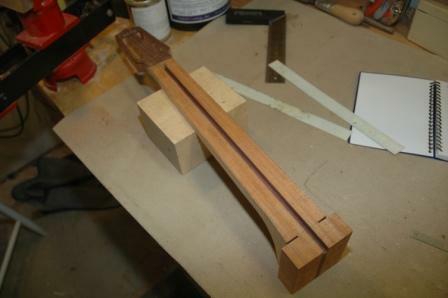 These steps precede attaching the bridge, bolting on the neck and moving to final setup (fret dressing, nut and saddle shaping, install tuning machines). Based on this schedule, I am about 3 weeks away from completion. Spraying is a lot of hurrying to wait. 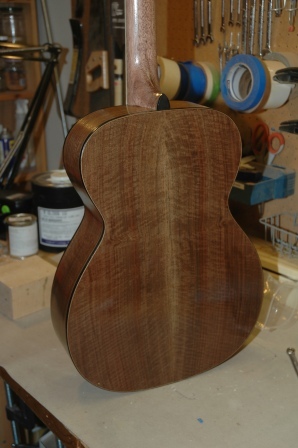 I can fill the gaps in time by continuing on construction of the hybrid Macaferri and the koa tenor uke. Next week I will be receiving a cutaway ram to install on my side bending machine. 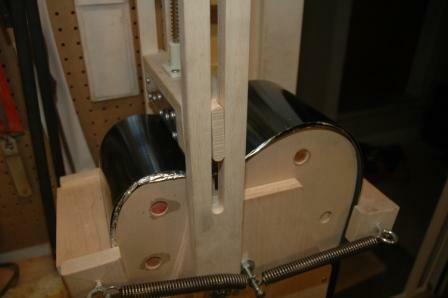 I have also devised a use for this ram on a side bending machine built purposely for uke sides. 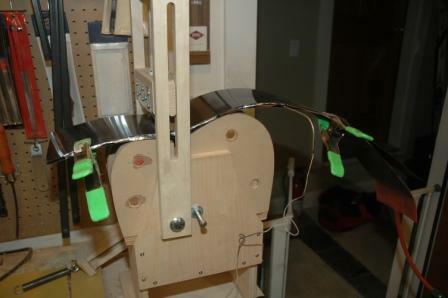 Since my current machine is too large to properly bend uke sides, I am constructing a bending platform which will use the cutaway ram for the waist bend for uke sides. Pictures coming later. The Macaferri body is new to my arsenal, and so is a cutaway. 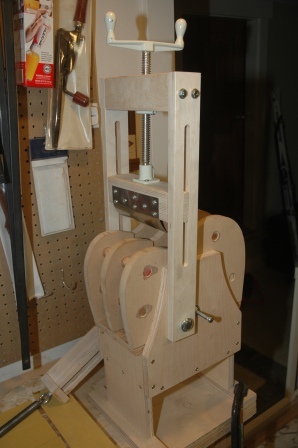 I needed to build bending molds and build or procure a cutaway ram for my bending machine. I located a fairly inexpensive ram from Bluescreek out of Pennsylvania, and it should arrive by the end of the week. I’ve also got a good idea about using the ram for a uke side bender, as the full sized bender is too restrictive for the small sized ukes. 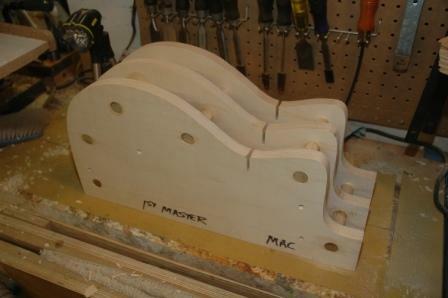 Using the Mac plans, I created an acrylic template, then transferred 1/2 (the side without the cutaway) to birch ply. I cut out 6 half plates, 3 for the regular side, and 3 for the cutaway side. I finished one of the half plates a wee bit smaller than the actual size, and used it as the master for replicating the other 5 using the router table. 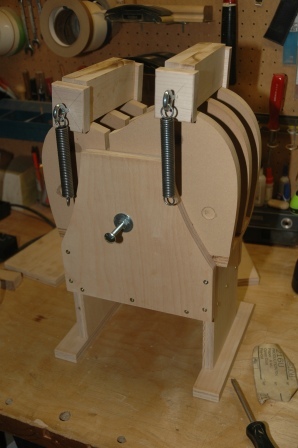 I assembled the non cutaway half first using existing spacers and 3/4″ dowel. 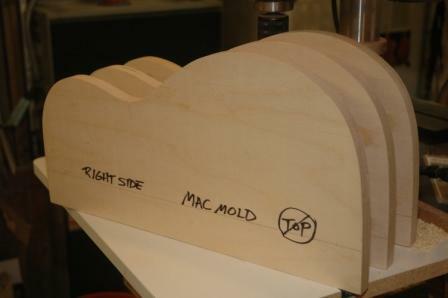 The master was then trimmed to emulate the cutaway shape, then the remaining two plates were trimmed on the router table. The dowels are secured with titebond and CA.